This is a simple and homely Japanese dish, sometimes made as a quick snack or even to make use of leftover rice. It is extremely versatile in the choice of toppings and here I’m using one of the more common toppings – grilled salmon and furikake, which is a mixture of dried fish and seaweed. But the combinations are infinite, as you can top it off with ikura or tamago or anything that you choose. Even furikake itself has many different combinations of ingredients – some have seaweed, some have dried prawns, etc. Just mix and match! 1. Rub a generous amount of salt on the surfaces of the salmon and leave it for 10 mins to be absorbed. After that, rinse and dry it, then grill the salmon for about 7 mins on high heat. 2. Make some dashi stock, about 1 teapot’s amount, and then use it to boil the green tea. Steam the Japanese rice as per the instructions. 3. When the salmon is done, take it out and use a chop stick to break it up into flakes. Now scoop the rice into a bowl, sprinkle 2 tbsp of furikake and nori strips over the rice. 4. Scatter the desired amount of salmon flakes over the rice, and then fill up the bowl to about 2/3 with the tea. Finally top it off at the side with a dab of wasabi, which can be mixed in with the ochazuke as wished. 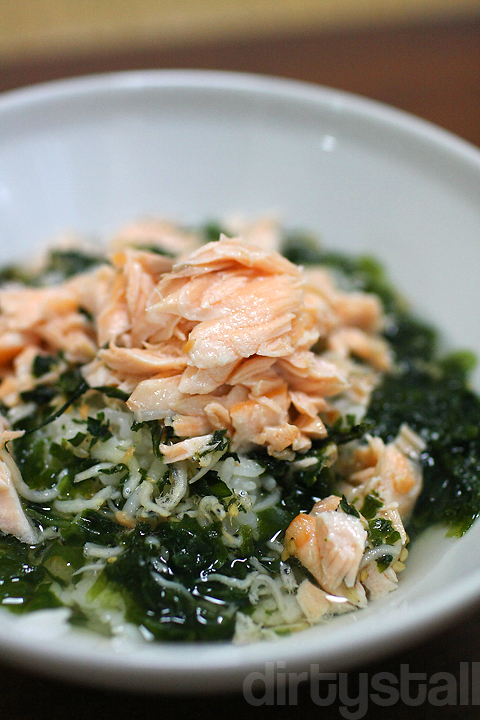 9 Responses to "Salmon ochazuke"
This looks really good! 🙂 How long did you take in all? 30mins? Hehe thanks! I think I took about 15 mins to cook it all since grilling salmon, cooking rice and boiling tea were all done simultaneously. But of course I had to salt the salmon first in advance so I guess total time was close to 30 mins. sounds delicious and healthy … the pics look great as usual! Didn’t know it was this easy to make this dish. Will try soon. Thanks for the post! Yup it’s very easy and great for a quick meal!